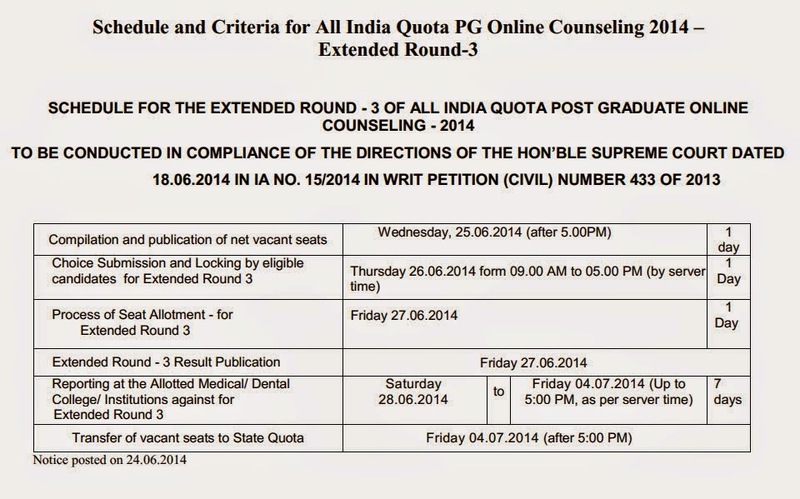 AIPGMEE 2014 Extended 3rd Round of counselling - AcrossPG Exams! Eligibility Criteria for Extended 3rd Round. 1. The candidates who are admitted through All India Quota (AIQ) and are still admitted (continuing) on allotted seat in AIQ participating colleges. 2. The candidates who are registered but not allotted seat in Round – 1, 2 and 3. 3. Candidates whose allotted seat got cancelled (in earlier round) due to change of category and is otherwise eligible for allotment of seat in changed category. 1. The candidates who have not joined the seat/ College allotted through AIQ. 2. Those who resigned from the AIQ seat.